Mike has confirmed the arrangements with Saracens for next season. Basically both clubs will be registering separate teams at both U15 and U18 level, and the intention is to have as many independent fixtures as possible, but current player numbers (at both clubs) are such that such games are unlikely to be full sized, at least at the start of the season. As a result a "cluster" with Saracens - likely to be called "Letchworth/Saracens" (much as last season Welwyn and OA Saints combined to play as "Welwyn Saints") - has also been registered. This will allow us to field combined teams (U15 and U18) in the Thames Valley league (which Saracens have been playing in for the past two seasons) as well possibly other competitions which either club, on its own, could not currently enter. The problem with clusters is that they can quickly become "clubs" in their own right, but by keeping our own separate fixtures alongside the clustered games we will be able to keep our own identities. At the same time it will allow everyone to take part in any competitions next season without having to wait while the clubs build up their squads - and, because we are at opposite ends of the county, we will not be competing for the same players, which can be a problem with clusters of neighbouring teams. So 2009-10 looks like being one of the most exciting, and varied, seasons so far with a full fixture list of games for both age groups. And if you are wondering how far away the new season is... see above (the clock is currently counting down to the first Sunday of September - when the season officially begins). International women's rugby still lacks any sort of official ranking system. The men's game has a system run by the IRB of bizzarre and Byzantine complexity but for some reason it seems that their statisticians - while willing to spend hours comparing the relative performances of the men's teams from major rugby nations like Vanuatu and Monaco - never seem to be able to find the time to look at women's results. Admittedly identifying the top two in the world is pretty easy - New Zealand and England. Over the years the Black Ferns have won an amazing 49 out of their 51 internationals, and haven't lost to anyone since 2001. Since then they have had 23 straight victories - which I believe is a world record. Running just behind them is England with a record of 129 wins (and one draw) which means that England have won way more games than anyone else - but they have also played more games than anyone else (150 to date). But which nation comes next? Canada are one team, on current form, which many would feel have one of the best cases for the third podium spot, and this weekend they were playing against their greatest rivals, the USA (right). This was their 22nd international in a series with the USA that the USA used to dominate. But since 2006 Canada had won four straight games, and were favourites to extend the run to five in a row - which they did. However, the USA made them work for it. 5-5 at half-time the game could have gone either way, but ill-discipline in the American's ranks in the second half (their coach complained about them "not following the gameplan" after the game) allowed the Canadians to quickly build up a 15 point lead and, though the USA came back at them, this was enough to ensure an eventual 25-17 win. Sounds like a good game, though, and a full video recording should be available online in the next few days (free!). However, Canada's early years were pretty difficult and - even if you look at just the last 10 games - they have only won six. Based purely on results there are other countries have better records than that. France, for example, have 94 wins from 134 internationals overall, and six (plus one draw) in the last 10, while Wales are doing even better with eight wins in the past 10 games (including the famous win over England last season). But, statistically, one team beats them all. One nation has an (admittedly short) all time record that (in terms of percentage of wins and games) is close to Englands. They have won eight of their ten internationals played to date - and drawn one of the others. And they just won their regional championship for the third time in four attempts without conceeding a point, but scoring an average of 72 points per game. These international superstars are... Trinidad and Tobago (right)who last weekend strolled to the NAWIRA Caribbean title, beating the Cayman Islands 48-0 in the final. But it is a sad fact that the Trinidadians have no-where to go. A combination of lack of money, geography, and the IRB's decision to not even give them a chance to compete for a place in the World Cup leaves them isolated sharks in a small pool of goldfish. Occasionally the USA and Canada spend a sunny weekend in the Caribbean playing sevens, but neither established nation has ever offered the Trinidadians (or come to that a combined West Indian team - the men field one, so why not the women?) a test match. Is there a need for a little more imagination from the more established nations if they really believe in expanding the game? News today that many of you can look forward to an early return to Hartpury College next season - last visited for the splendidly organised Gloucester City 10s. However, if you play in this game you will be wearing the green of Hertfordshire - and one of the opposing coaches will be rather familiar. Hertfordshire have been invited down to the west country on 8th November to play both Somerset and former Legends coach Joe Randall's Gloucestershire teams. As you will recall, Joe became Gloucestershire's coach last season - as well as manager of South West North - and had hoped to organise a game between his girls and Herts, so it is good to see that something has been arranged. Final details have yet to be confirmed - and more news will appear on the Herts blog in due course. Note that to be considered for this and other county games you will need to attend county training/trials on 13th September. If sufficient girls make themselves available Herts will organise two squads at both age groups. Two other inter-county tournaments have also been organised - see Key county dates on the Herts blog for more details. Continuing with a small theme started in the previous article, financial problems which may have prevented South African participation in the Nations Cup have also hit this week's the Caribbean championships with two of the leading nations unable to attend. Guyana's withdrawal was already known, but only a couple of days before the start Jamaica also pulled out citing funding and travel problems. "They were just too big and rough for our young inexperienced side." "Trinidad and Tobago were just far too good and speedy for the girls from SVG. The scrums went uncontested after about ten minutes as they just could not cope with the pressure. As it was they had some nasty injuries, so that made things even worse." Three days later the reverse games were no happier for the newcomers as Trinidad beat Barbados 78-0 and Cayman beat St Vincent 76-0. "They were different games in that the Vincentiannes played with more fire right to the end, whereas the Barbados game was whistled off early due to injuries." If there are any Barbadian women left standing they are due to play St Vincent tomorrow, while the Caymans play Trinidad play for the title. It is possible that there will be video from the senior game as well (there are even on-going attempts to get it streamed live) - more on that should anything appear. RFUW have announced today the squad for the U20 Nations Cup. As Lizell mentioned at the National 7s selection was not automatic - fitness tests were required - but it seems that both she and Sasha have both passed these and can now look forward to roughly two weeks of intensive training and rugby as part of England's bid to retain the U20 Nations Cup (see 2008 results here). England will be up against the USA, Canada and Wales in what will be close to a U20 World Cup (especially as New Zealand have never played age group rugby) - it will certainly be a look ahead to many of the players who will be at the 2014 World Cup. None of England's games will be easy, though it is difficult to see past their retaining the title (especially with the help of home advantage). The Welsh in particular have improved significantly over the past 12 months and will be a challenge to the North Americans. Canada (where, as we know, rugby is now a major sport for girls) are always a threat at all age groups, while the USA are a bit of an unknown having played little age group rugby since their tour of South Africa last year where they only drew the series 1-1. In fact it was initially suggested by Canadian RFU contacts that South Africa were going to be involved, and in some respects it is a pity they are not. Opportunities for countries outside North America and western Europe to play any international rugby are so few and far between, and the South Africans looked so good against the USA, that it would have been good for the game's development if they could have taken part. A promotional video produced by the IRB won a major award at the 2009 New York Film Festival. It has since been viewed by 250,000 people - and now an " improved" version has been produced. The video was kept under wraps until it was premiered as part of the IRB's presentation to the IOC earlier this month - and now the new edition has been released to everyone else. The most significant changes are the inclusion of clips from the Sevens World Cup - and in particular more footage of women's rugby. Women featured in the original, but now they get more than just a walk-on part. Its actually a pretty impressive piece of work. It would be interesting to see what - if anything - the other sports have produced to compete with it, not least because it would be a tough ask to compete with this. Click here for a higher quality version. Being an England international is close to being a full time job with little or no break between one season and another. You may have ended your season at the end of May - and some clubs are just starting their pre-season training for the 2009-10 season - but for England the 2008-09 season is still in full swing. Their next challenge is the defence of their European Sevens title. After a disappointing IRB World Sevens, next month England will take on the best nine women's sevens teams at Hannover in Germany. The two day tournament will run from 11th to 12th July, and the draw has just been made. England are in a group along with Portugal, Sweden, Spain, and France and will play the first three on the Saturday, finishing off their group games on Sunday morning against France. After that it will be the quarter-finals, semi-finals and (hopefully) a final - and another trophy. Then its all of two weeks before the new season starts on 1st August - with the team immediately jetting off to Canada for the Nations Cup! The worldwide reach and growth of women's rugby is demonstrated this weekend when the fifth Caribbean Women's Rugby Championship kicks off in Barbados. Despite being left out in the cold by the IRB's World Cup plans which give them no opportunity to compete for a place in next year's finals, Caribbean women's rugby continues to grow. The Championships - run by NAWIRA (North America & West Indies Rugby Association) - included only two teams back in 2003, when Trinidad beat Jamaica over two games to lift the first title. 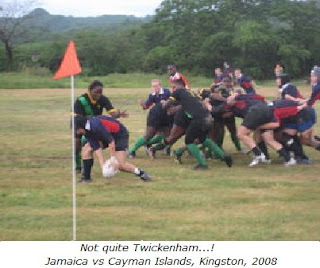 When revived (in Jamaica) in 2006 the pair were joined by Guyana (Jamaica winning this time), and the following year the tournament should have expanded to four teams when the Cayman Islands hosted... until a hurricane ripped through the island the day before the tournament was due to start (not a problem generally faced by Six Nations teams over here). The same four competed last year in Guyana - with Trinidad pipping the hosts on points difference - and this year the circus moves on to Barbados and sees the international debuts of both Barbados and St Vincent XVs. The only set-back in this rapid expansion is that Guyana will not be at this year's tournament - there is no information anywhere to explain why, but presumably finance will have something to do with it. Money is certainly one big difference between these six rugby nations and their European counterparts - and you have to wonder if the carrot of World Cup qualification might not have improved things a bit on that score at least. As a result the entire event will take place in a single week, rather than being spread over a month and a half, with all teams being faced with four internationals in seven days - and in the heat of a Barbadian summer (and you all thought that Harpenden was a bit warm this year)! Another difference is the make-up of the teams. These are real amateurs as the biogs of the Cayman players (average age 36) shows. No lottery funding here - or month long training camps. On the other hand, whatever funding the Caymans get will be well spent - at least three of them are accountants! The Six Nations in Europe also takes place in the glare of publicity compared with this event. Seriously - most of the competing nations' websites don't mention the tournament (assuming they have websites!) and even the host has yet to officially publish the match list (though it has been tracked down). As for the likely winners, the absence of Guyana means this really is a two-horse race between Jamaica and Trinidad with the latter most likely to retain their title. The Caymans should record their first international win sometime during the week, but when it comes to Barbados and St Vincent... who knows! However, the main message to come from this tournament is the strength of the women's game. This will be the last tournament of the 2008-09 season, during which there will have been 51 internationals making it the second-busiest non-World Cup season ever. And the busiest was last season, 2007-08, when were 69 internationals (the difference was the lack of a European championship this year). That is 120 full 15-a-side internationals in two seasons, with games being played on every continent by 30 different nations. Its a record of strength and diversity that few women's team sports can match. Despite the general lack of publicity in most islands, you can catch an interview with members of the Cayman team as broadcast on Cayman Island TV's "Daybreak" programme. Its actually pretty good. When did the England team last get this sort of respectful coverage? Clearly there is a higher standard of sports journalism in the Caribbean! "There is not a sufficiently robust case to refuse planning permission for the expansion of pitch sport facilities on this site in policy terms. In my view the Rugby Football Union and Sport England have demonstrated that the two clubs who presently occupy this site have a growing membership and therefore have a genuine need to expand. The proposed development is an appropriate development in the Green Belt in that it represents essential facilities for outdoor sport and recreation." As you will have seen from the plans on the club noticeboard, this will give us three new playing pitches, along with training areas, and - in the long run - a new clubhouse. Plans also foresee the levelling of the main pitch and the creation of an all weather pitch where the current second pitch is (share with Letchworth Eagles) along with improved floodlighting (admittedly that would not be too difficult!). The only major objection seems to have come from 38 residents in Quinn Way and Schoolfields (behind the current Hertfordshire football ground) who fear "foul language, loudspeakers and air horns on match days". I did wonder if they had any of our players in mind (or coaches), but seriously you do have to have concerns about people who buy houses next to sports fields and then complain about people using them... (Sigh). "The aim is to cater for the increased membership at the two clubs, by providing a high quality floodlit training area, three new full-size rugby pitches, two mini rugby pitches, two additional junior football pitches, extra car parking facilities and improved access via Legends Lane." She also confirmed that the farmland has not been used in recent times. The only downside is that it will be a while before anyone can look forward to running out on the new pitches. "The proposals are at a relatively early stage", said Marilyn, "and the funding and costs details have still to be finalised, as is the possibility of grant assistance for the scheme by the Rugby Football Union and Sport England." So - a while to go yet, but a good start. The latest issue of Sportsister electronic magazine (worth signing up to - it is free!) includes a useful guide to avoiding injury. Obviously the guide, like the magazine, covers all sports but rugby gets several mentions and includes contributions from Claire Lawrence, head physio at London Welsh. Its in two parts, Part One concentrates on leg and foot injuries and Part Two covers hip, thigh and upper body problems. Well worth a look at - especially the more injury prone amongst you - and not least because you can start putting the suggestions for prevention in place now - before the new season (and injuries) start! The campaign to get rugby sevens into the Olympics faced its biggest test so far this weekend when it and the other six bidding sports made their presentations to the IOC Executive Board at Lausanne in Switzerland. This was a vital meeting as it was the last chance each sport had to appeal directly to the IOC's main decision makers. It is likely that, after the next IOC meeting in August, only two sports will go forward for possible inclusion in 2016 Games. There is no certainty that any sports will be selected - that is what happened four years ago - so even making it through to the "final" will not guarantee anything. Remarkably, most of the most knowledgeable observers see rugby as one of the main front-runners. 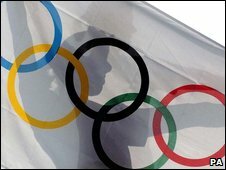 It is one of three team sports under consideration, but the other two - baseball and softball - were only dropped from the games four years ago, which is why the vacancies appeared and the suggestion is that the IOC would not want to be seen to be changing its mind so quickly. Certainly baseball - which could not even promise to produce its best players for an Olympic tournament (though it generously said it US Major League Baseball games would take place on the same day as Olympic games) - seems to be losing ground. On the other hand rumour has it that softball - a major women's sport - was dropped largely by accident because too many IOC delegates confused it with baseball - so it is possible that delegates might want to put this right. However if softball does not make it, rugby - who included two women in this six-strong delegation - looks very well placed. Supposedly the IOC were impressed by the Sevens World Cup despite the fact that it attracted almost zero press coverage even in Wales, who won the mens tournament. Clearly the IOC have learnt a lot from the non-inclusion of women in its 2005 bid but, as has been said on here before, the question is how deep the IOC's commitment to women's rugby really is. Personally I doubt it as actions do not seem to follow words and the IRB is miles behind FIRA, for example, in its practical support of the women's game. However rugby's supposed most significant competition is even worse. Golf is still run by a private club that bans women from being members and would saddle an host city with the need to find a championship 18-hole golf course (not cheap). On the other hand the sport does have a huge marketing and TV audience, especially in the USA (whose TV networks bankroll the Games). While leaves roller sports, Karate, and squash trailing, perhaps because of low marketing and TV potential. So at the moment it looks like the IOC will pick two from softball, golf and rugby. However what no-one seems to be talking about is what effect on the game inclusion in the Olympics will have, both women's rugby and the game as a whole. It will undoubtedly lead to better funding of rugby countries like Russia - but the risk is that that will be better funding for sevens, not 15s. Not sure they did this two years ago. Something for the scrapbook (wasn't it Nikki who used to keep a scrapbook of all our press coverage*?). Model for RFUW/RFU integration now goes for merger. Next year the RFU and RFUW will join together as a single organisation to run rugby in England. Well, sort of. For many years there have been "merger talks" between RFU and RFUW. Exactly what was talked about has never been fully revealed, but most of the explanations/rumours for why the talks never seemed to get anywhere seemed to have £ signs attached which seemed to point to a certain lack of trust between the two bodies (probably justified). However, as reported last year, not terribly veiled threats by Sport England to cut funding unless they got on with it concentrated minds a bit and the result was an agreement to come together. But the big headline hammered home from all quarters was that this was NOT A MERGER. It will be an "integration" with RFUW remaining in existence as a "constituent body" within the RFU. What exactly this will mean is anyone's guess - not least because there are very few similar set-ups in other national Unions. In most cases most countries that have gone down this line have gone for full merger, with a single organisation responsible for all parts of the game. The only set-up similar to the proposed RFU/RFUW "integration" seemed to be in Scotland - in fact some senior RFUW officials quoted that as being the model they were following. So its rather fascinating to read today that the Scottish Women's Rugby Union (SWRU) has now changed direction and decided - unanimously - to wind itself up and merge fully with the Scottish Rugby Union (SRU). Assuming the SRU agree the SWRU will cease to exist on 27th June. Its not difficult to see why. Though not all mergers have gone well, the most recent ones in Wales and Ireland have been extremely successful. On-field performances in both countries have improved significantly - even dramatically - at all levels, and participation rates have shot up, while in Scotland their national team has been barely able to hold their head above water. This is not to say that the RFUW/RFU integration plan will not work - women's rugby in England is so much bigger than it is in Scotland, and details about what "integration" will actually mean have not really been properly communicated yet. But when everyone else now seems to be going one way you do wonder whether such a unique model in England will prove to be best solution. You may remember discussion at the end of last season about why our "originals" did so well when they started. Obviously they may have all be geniuses, born to play the game, and lead by an amazing coach. The other suspicion some of us have had is that for the first couple of seasons we (by chance) happened to have very forwards-based teams. This was partly because we happened to have players who turned out to be pretty good forwards, but mainly because the first few coaches had a good idea about what forwards did but were a bit shakey when it came to the backs. In fact as I recall we spent hours on tediously dull things like body position in the scrum, as well as endless rucking and maul drills - mainly because I understood those bits of the coaching manual rather better - and because its all technique so its much easier to coach (stand there, push here, lean like that, wait a minute while I turn to the next page... etc.)! I mention this not as an excuse for another trip down Memory Lane, but because some remarkable information has come out of a study of last year's men's Six Nations (it would be nice to think that similar studies were done on the women's tournament but somehow I doubt it). It is a bit of a truism in rugby to say that you cannot win without effective forwards - the best backline in the world is no good if they do not have the ball - and it seems that the champions, Ireland, were perfect examples of this. They did not exactly major in flowing passing moves by their backs - in fact very few Irish passing movements contained more than three passes (only one every 38 moves, compared to one in 15 for the other teams!). In one match they made just 82 passes! On the other hand Ireland was by far the best rucking team team - only turned over over seven times in almost 500 rucks and mauls! - a ratio far better than any other team. The moral from this - and our own experience in our first season - is that success is dependent on getting the forward play right. Win your scrums and retain the ball at the breakdown and even complete novices can be competitive. So - if you are unsure what position to play next season - be a forward. Last week we reported that the new women's league structure had placed our nearest adult team - Hitchin - in a division largely featuring teams from Sussex and Kent. Some of us suspected that the club had been lumped into that division because it was assumed that - as the M25 goes through Hertfordshire - Hitchin must be somewhere in north London. So it is good to hear that, having been in receipt of complaints from Hitchin (and maybe an atlas), RFUW now realise that the Hertfordshire is not a London borough and moreover that the north of the county is actually in East Anglia. As a result we read that Hitchin have been moved to a more sensible division (details have yet to be announced). Herts Sports Awards: nominate now! We've done pretty well at the Herts Sports Awards over the years. We haven't actually had any wins yet, but we've had a fair few runners-up (including Katie Alcock last year, and Joe a couple of years before) and half a dozen or more "finalists". The awards ceremony is in October and if your nomination gets thought to the "final" you will be invited along as well. For more information click here to see the nomination form. East Terrace was a very funny rugby website, full of "news" articles that at first glance might seem genuine but were in fact often brillant spoofs or amusing takes on current stories. The site first lauched in 2004 but by last year it reached a point where it was rarely being updated - a shame, but it happens. However, the good news is that it has now been revived. Working in association with Scrum.com the New East Terrace is now a blog with new items appearing every two or three days. While it does concentrate pretty much exclusively on men's rugby its still worth dropping in on, or subscribing to. Or might it soon become so? A little extreme maybe, but one - presumably unintended - consequence of recent and planned legislation could make the way that women's rugby is currently organised illegal. And ironically it is the result of legislation on equality. When the new Equality Bill came out a few weeks ago (see previous article) it contained some clauses that would seem to help the game, but buried deeper in the Bill seemed to be clauses that were more of a problem. Not quite sure whether I was reading them right I contacted the local MP who in turn asked the House of Common Library to do some research. The problem stems from when we play - ie. on Sundays. Pretty much all women's and girls' rugby at all levels takes place on Sundays, so it is not that unusual for girls who are interested in playing rugby to find that they are unable to play because they also do other things on Sundays - horse-riding or relative visiting or netball playing or whatever. This was always unfortunate, but in the end a matter of choice and their priorities (well, either theirs of their parents). However some girls could not play because they go to church - I can think of three or four cases where this applied. Still a matter of choice? That was always the thought - indeed throughout sporting history there have been players who could not play on certain days for religious reasons. They even gained some admiration because of the way they stuck to their consciences - but teams played and races were run and the world went on. But that is no longer the case (or certainly will not be if the Bill becomes law). Because this will be defined as "offering services at limited times where this conflicts with religious observance" and therefore "indirect religious discrimination". Honestly. I thought that was a bit mad which is why I asked, but the House of Commons library confirms it. The only defence will be if it is for reasons of "health and safety or business efficiency". It may even be the case now (due to the 2006 Act) - the advice is unclear on that point - but the new Bill tightens things up so it is no longer a matter of doubt. From here on the four pages of detailed text are full of "coulds" and "might bes" and quite small print - and in the end whether or not anything actually happens depends on whether any girl (or parent) complains to the Equality and Human Rights Commission, and then the views of the Commission (and ultimately a court) but one thing is clear - rugby clubs really need to make sure that their legal insurance is up to date. Nothing stays still in the world of the women's rugby leagues. Teams rise and fall, resulting in annual shakeups of leagues which - while partly based on last year's results - can mean significant moves up, down and sideways. Looking at the new structure, announced by RFUW yesterday, it is our nearest neighbours and probably home for most of our "graduates" who face the biggest changes. In a redrawing of boundaries that makes you worry a bit about RFUW's knowledge of basic geography Hitchin are now the far northern outpost of what is otherwise (with the exception of Tabard) a Kent and Sussex league. The hedgehogs will be getting to know the M25 pretty well as they travel to Beckenham (Beccehamians), Tonbridge, Medway, Dover, Hastings and Footscray (which I thought was an Aussie rules team from Melbourne, but which in this case may be from SE London). Quite why they are in this division when there is a separate (and smaller) league based around Essex and the Eastern Counties I have a struggle working out. Maybe Twickenham does not own any maps? One division above them Old Albanians II and Hertford will also be getting to know Kent pretty well - apart from one local fixture against Harlow. Shelford are a division above them in Midlands 2 with visits to Lichfield, Buckingham and "Cambridge Select" (who are a new one on me. The university maybe?). Above them Saracens II and Old Albanians I are in South I with trips to Plymouth, Bath and Cheltenham in prospect, which leaves Saracens I in the top tier travelling... everywhere. So - come September - wherever our ex-U18s go they have some long journeys to look forward to. Bu then they are used to that! So you think you know the laws? The IRB have just launched a superb guide to the new laws of rugby (ie. now that the ELV dust has finally settled). This really is a "Must See" for anyone and everyone - players, parents, managers, coaches, and those who occasionally referee! To begin with the guide has the text of all the laws - but with videos from real games illustrating most of the major points, making all the normally dry text far more easy to understand. You can also download a PDF of the entire laws. However - that is just the start. The really clever thing is the "Law Exam" - and online test of all the laws. Each of the 22 laws - plus 7s, U19 variations and referee signals - has its own module (so 25 in all) and you have to get five question right to pass each one. But the really fun part is last one - the video test - which brings it all together and turns you into a video referee. Why did the referee blow his whistle in that clip? What should he award? What infringement took place while that try was being scored? What should happen next? Its quite tricky - and frustrating when you get four right and then mess up on the fifth question and have to start again! Test a friend - see who can finish a module, or even the whole exam, first! You will recall that a couple of weeks ago the New Zealand sacked their women's coach. Some of us thought that maybe they had realised that a certain supercoach had returned to the Land of the Long White Cloud - a coach with experience of dealing with some of the world's most challenging female rugby players - and that they were about to sign him up. However, it seems we were wrong. News from the antipodes is that NZRU have completely overlooked Simon Hill and instead have picked some guy called Brian Evans based on the fact that he had coached Auckland (who provided 14 of the players in the most recent Black Fern squad) to the national championship - as if that was a better qualification than coaching Letchworth Girls! You may have noticed a few small changes to the layout of the blog - including the photo slideshow in the column on the right. This is the result of various new and improved "gadgets" that have been released. One of the best of these is rather less obvious, however, and that is the search option (also in the right column). This is much improved - apart from anything else the results appear on this page rather than taking you elsewhere. It also has options that allow you to direct your search at just this blog, or sites linked to from the blog, or the entire web. Try it out and see what you think! A couple of weeks ago it was confirmed that the World Cup Final next year - the most important game in women's rugby worldwide - would not take place at Twickenham but would instead be at The Stoop - the nearby home of Harlequins RFC. The only explanation for this that I have heard is that Twickenham now demands a minimum guaranteed number of ticket sales for any game to be staged in the stadium, and that the organisers of the Women's World Cup could not meet these demands. Quite a lot of (on the face of it) quite minor domestic games do take place at Twickenham - Army v Navy, Oxford v Cambridge University, etc. - but these rather less important fixtures do sell quite a lot of tickets, so the apparent discrimination against women's rugby was explicable in hard economic terms. Then ask yourself this question. Do you reckon that the final of the Women's World Cup next year will pull a bigger crowd than Hertfordshire v Cheshire? Given this, I suspect many people will be fascinated to learn the real reason why the World Cup Final is not being played at Twickenham. After all it cannot be that it is because its a women's world cup, can it. There must be some other reason...??? RFUW continue to try to be more "In Touch"
Those of you with impressively - even embarrassingly - long memories may recall that way back in November 2007 the RFUW surveyed everyone with any role in women's and girls' rugby. The "In Touch" survey was pretty open ended and the main results (plus RFUW's initial responses) appeared last June. At the time these responses were pretty underwhelming, generally boiling down to "look on the website", but with another year gone by some rather more helpful suggestions and initiatives have been developed and a summary of these appeared today. The first thing to notice is that the standard "its on the web" has been largely dropped, being replaced with an aim to "ensure that information is available through our communication channels". In practice this may just mean the same thing, or it might be an acknowledgement that the RFU website is a nightmare and that there must be a better way - its rather difficult to be sure at this stage. A key use of these "communication channels" will be to make sure that everyone knows about coach training courses - so when the new season starts it may be worth asking Carla and Mel how effective these "channels" have been. A more concrete response to the survey has been the development of new training and funding to help volunteers with all the off-field work involved in running clubs. Since last year RFUW have been behind the launch of several NVQ level 2 and 3 courses of use to volunteers, and have also organised first aid courses. Progress has been a bit more patchy in other areas. 97% of respondents were critical of the facilities available to women and girls, and here much is made of the Club Development Toolkit Fund, but as this was only worth - at most - about £500 per club (and for only a handful of clubs) its difficult to see how much difference this will make in practice. There is also talk of "other funding streams" but in truth poor facilities is an attitude problem, rather than a financial one. If women and girls find their facilities are poorer than their male clubmates - that they only ever get to use the third team pitch on Sunday afternoons after the bar has closed - it will invariably be because of the attitude of their clubs (who, it is worth remembering, they pay as much membership fee to as the men do). At its extreme the RFU are themselves guilty of this with their refusal to allow the World Cup Final to held at Twickenham, despite the ground being made available for all kinds of less important and rather more forgettable domestic men's (and even school) games. No amount of funding will change the reasons behind this - it is discrimination, pure and simple, and requires a rather more fundamental changes of attitude. "We have dedicated staff members working to ensure that all information is displayed on the website." These will be the dedicated staff behind the timely, comprehensive and accurate report on the National 7s that appeared a couple of days ago then - good to see that that is working. The effectiveness of the arrangement can also be gauged by the fact that this survey response is not yet on the website at all - so I've put it here. PS. The National 7s article does now have a picture. Guess who?